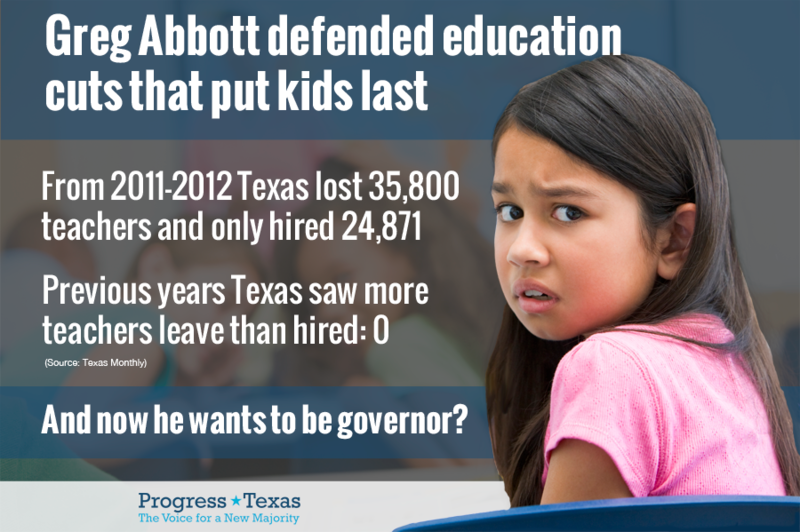 Maybe this is why Greg Abbott refuses to answer questions about Texas' public schools. For the first time in Texas' history, more teachers left Texas' schools in 2011-2012 than were hired. This occurred at the same time that enrollment increased and Texas Hispanics became the largest ethnic group in Texas' public schools. The number of first-year teachers in Texas public schools dropped more than 40 percent in just four years. Texas schools employed just shy of 15,000 first-year teachers in 2012, down from 25,395 in 2008 - despite growing enrollment and an overall increase in the number of teachers. What's more, 2011-12 marked the first time in recent history that more Texas teachers left the profession than entered it. Texas public schools lost 35,800 teachers through attrition and only 24,871 new teachers were hired, according to Texas Education Agency data. About 23 percent of Texas schools have a Hispanic student population of at least 80 percent. Fifteen years ago, it was 16 percent. About 25 percent of Hispanics live below the poverty line. Over a two-year period starting in 2010, the the number of low-income Hispanic students in Texas public schools increased more than 76,000 — the largest number for any racial or ethnic group.